One of the best ways to really see the diverse landscapes and personalities of the U.S. through a train window as you travel coast to coast. This summer I partnered with Amtrak to travel from New York City to San Francisco and back, traveling over 7,000 miles across 20 states in about 143 hours of train time. I took six different train routes over 12 total days including a two day layover in Chicago and a two day layover in San Francisco. When one thinks of traveling across the U.S., driving is usually front of mind, followed by flying, but train travel is a perfect alternative for travelers looking to see more than the road in front of them or the clouds around them. Trains across the U.S. are a very popular option for short trips between nearby cities. For example, from New York City to Washington DC, three times as many passengers choose Amtrak than all of the airlines combined! Amtrak operates a nationwide rail network in the U.S. serving over 500 destinations over 46 states with about 30 million customers in FY 2016. However, only 1/6 of Amtrak’s customers traveled long distance, between 764 miles and 2,438 miles. (Source) I was one of the minority, traveling not just long distance but across the entire country, and back! I traveled from New York – Washington DC – Chicago – Los Angeles – San Francisco – Chicago – New York. Read on for more about my route, the people I met, and the steps I recommend to make a cross-country dream trip like this a reality! Plan the route: Taking the scenic route is all about the views and the stops along the way. Think about where you want to visit and which scenic routes you are most interested in seeing. 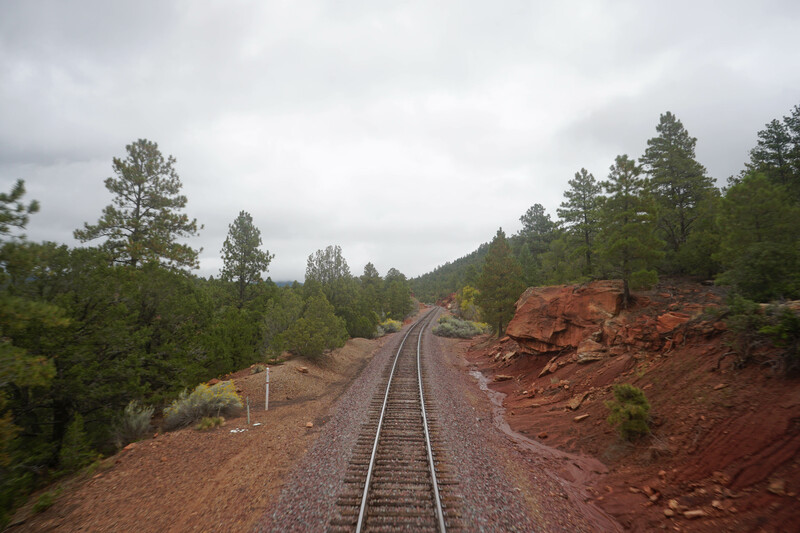 When planning my journey, I wanted to visit Chicago and San Francisco and see different routes, so I prioritized the most scenic routes, like the California Zephyr and the Coast Starlight. If you’re not sure where to start, read our article which breaks down the Most Scenic Routes. Buy tickets: Once you know which routes you want to take and cities you want to visit, head to Amtrak.com to buy your tickets. I also called to ask questions about specific routes and suggested layover times between trains. I recommend you give yourself at least 4 hours in between different train routes to make sure you have plenty of time, if not a few days layover in cities you want to explore. Pack: Make sure to pack a carry-on with your necessities easily accessible and bring things like a power strip and a deck of cards. You can bring two smaller personal items and two larger carry-on items. For my 12-day journey, I brought one personal item of a backpack and one carry-on rolling bag. Bring comfortable layers and clothes that do not wrinkle. I lived in different yoga pants each day. Bring toothpaste, Tylenol and motion sickness medicine if you need them since they do not sell these essentials. It is also helpful to bring flip flops or shower shoes and easy slip-on shoes or slippers. Check out our packing list and packing videos here. Disconnect: One of the best reasons to take a long train journey is the view. 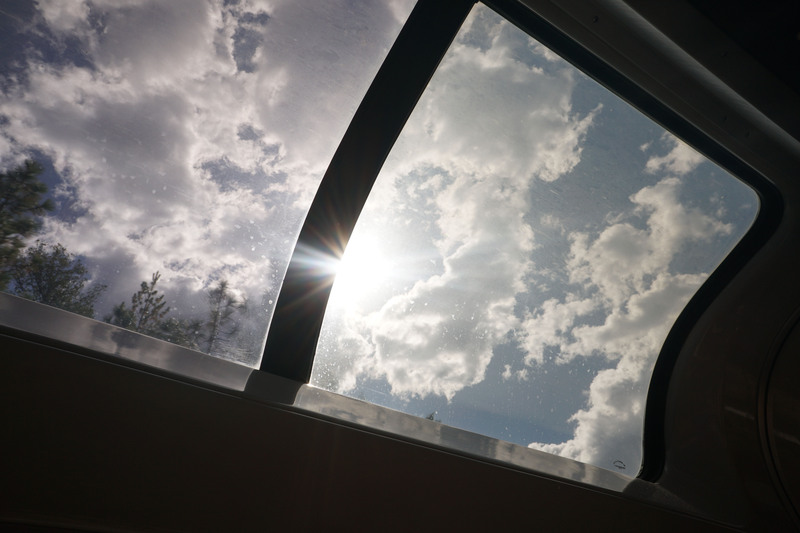 There will be areas where you might lose service or Wi-Fi, but embrace the opportunity to disconnect and do simple things like sit and watch the world go by through the large observatory car windows. Stops: Depending on how far you are going, take your time and extend your journey by staying a few nights exploring a new city. During my cross-country train trip, I stopped in Chicago for two nights and San Francisco for two more nights before traveling back to Chicago and New York. If visiting historic architectural stations is your thing, check out our Most Beautiful Train Stations. Dining reservations: Breakfast, lunch and dinner are included for roomette and bedroom customers. 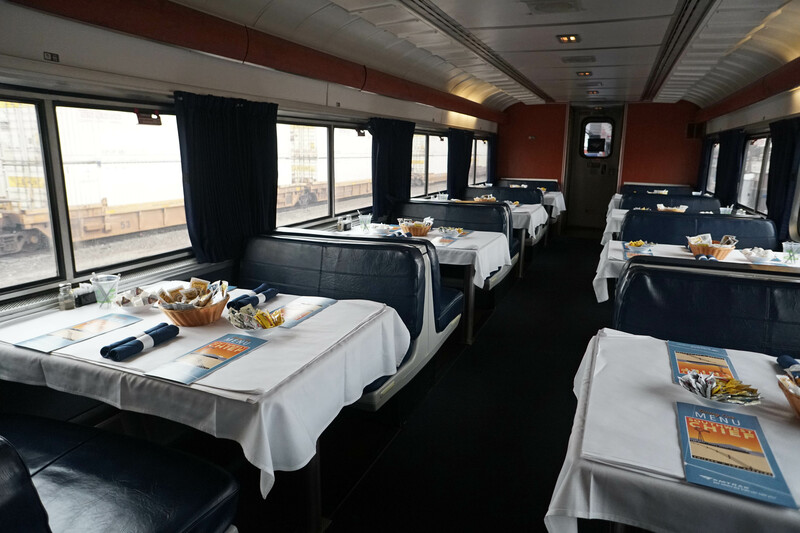 If you’re not in a roomette or bedroom, you need to try dining on a train at least once! Everyone is required to make a reservation for lunch or dinner. Enjoy a dish like my favorite, the signature steak, with views and new company. When you sit down for dinner it is easy to meet other passengers. Since there is limited space; the dining attendant will often seat you across from others so there are always four people at a table. Talk to people: When you’re traveling with someone it is easy to only talk with each other. 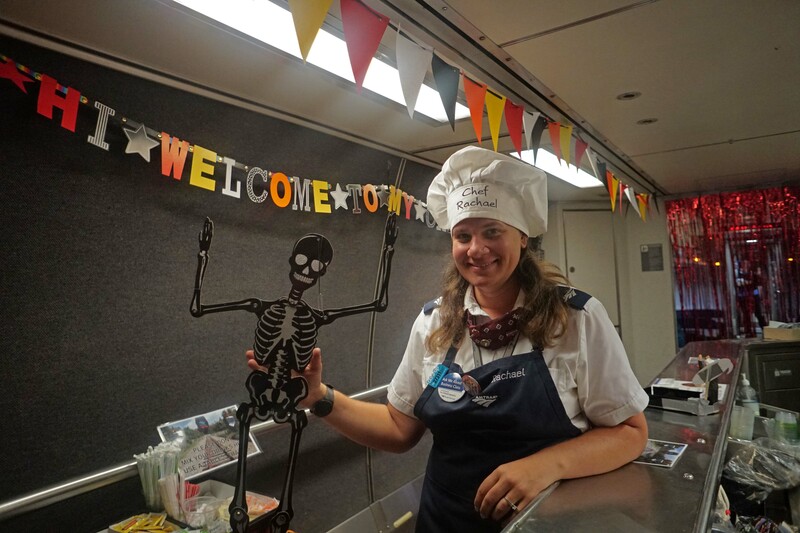 One of the best ways to meet other travelers is over a deck of cards or by introducing yourself in the dining or observatory cars. I had the pleasure of meeting so many different people, who were traveling on the train for a variety of reasons: to go home, to visit family, to take care of family, at the end of a business trip, to take a few days off, to show their spouse or kids the train. I met a man who was a proud model railroader. He and his wife finally splurged to take a trip across the country because of his love of trains. I also met one of the most wonderful, strong women travelers I’ve ever met who shared her story: “My husband and I had been planning this trip for eight years, but he had a stroke and his health prevented him from taking the trip. When I turned 70 I decided I needed to do this, I couldn’t wait, my friends chipped in so we could do it, I couldn’t have done it without them.” It was so amazing to hear how her friends came together to help her travel across the country to visit family and friends so that even without her husband, she was never really alone during her journey! Talk to the staff: Some of my favorite stories and moments along my cross-country trip came from conversations with the staff. A friendly smile goes a long way. We even got extra pillows from one helpful attendant. It is also recommended to tip your sleeper car attendants. Many attendants went above and beyond. They shared stories, and some even had DVDs and games so that we were always entertained. Scroll down to read some of my favorite quotes from the staff I met. Look for where there is glare so you can avoid it. Although I love the observation deck for enjoying the views, glare from the many windows make it much harder to take photos there than at your seat. Put your camera or phone directly up to the glass to avoid glare. On your camera adjust your shutter speed so it’s fast enough to capture the moving scenery. Make sure to focus on the scenic background and not the blur of moving trees closer to you. 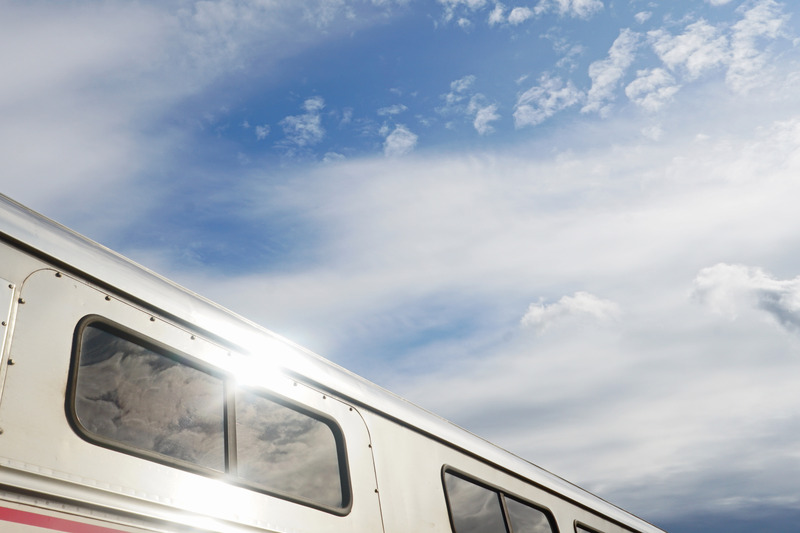 Get creative and include the glare or train in your shot for perspective! 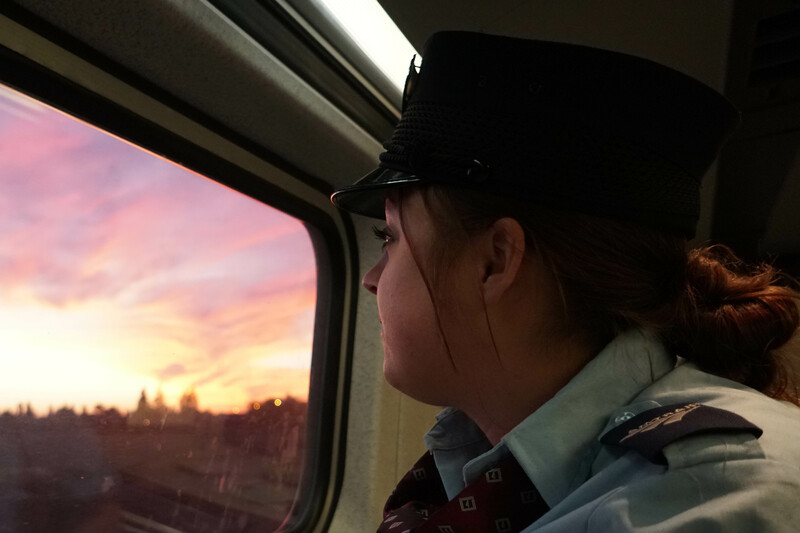 Women Conductors: There are 1,782 Passenger Conductors. About 19% of those identify as female. 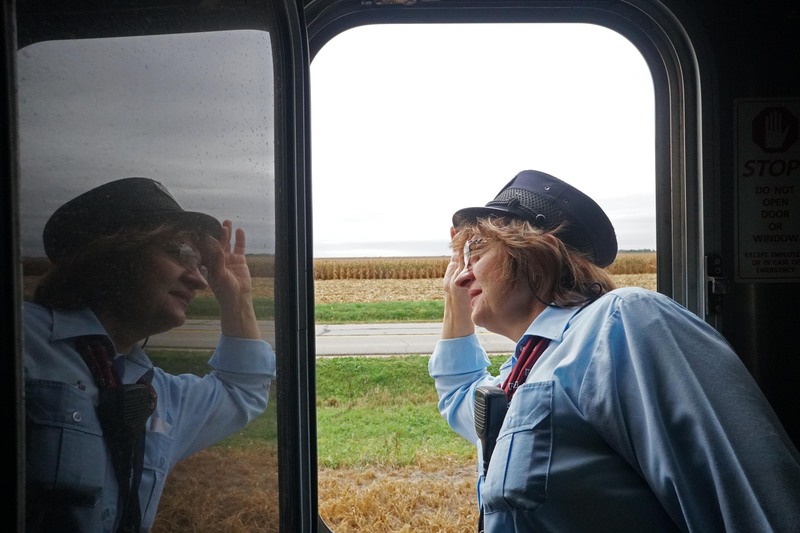 Train Portraits: I was lucky enough to meet some really dedicated train staff who often live half their year on an Amtrak long-haul train. Despite a unique work schedule which sometimes means four days on and five days off shifts and missing holidays or birthdays, almost everyone I met was so in love with their jobs and the trains that they couldn’t imagine any other path. Some went above and beyond to tell me their favorite train stories or tips on getting a great photo. One amazing conductor even informed me when the herd of buffalo would pass by so I could get “the shot.” A friendly smile and conversation goes a long way. Some employees who didn’t want to share a quote, allowed me to take their photo, here are some of my favorite train portraits! What are the different seating options? Coach is the most affordable option and is much more comfortable than most other forms of transportation. Compared to flying, you have more legroom, bigger seats and often your own power outlet. It is the cheapest option but on an overnight train means you will be sleeping sitting up. Business class comes with more amenities and a comfier seat for only a little more than the coach seat. First class on Acela includes at-seat service, complimentary meals, beverages and hot towels. There are three main types of sleeper car accommodations. The base Roomette Superliner includes two seats that fold into two bunk beds, with no in-room toilet, but a shared toilet down the hall. On certain trains you might have a Roomette Viewliner, which does include an in-room toilet. For extra luxury, the bedroom for two people comes with an in-toilet room and in-room shower. There are also bedroom suites for four adults, family bedrooms and accessible bedrooms, read more here. What are the bathrooms like? The bathrooms are compact but they are better than most airplane bathrooms. What are the showers like? The showers/changing rooms are a separate room complete with towels and individually packaged soap. Tip: If you don’t feel being adventurous taking a shower on a moving train, try to time your shower during a stop that includes a smoke break, so you have about 20 minutes when the train is not moving. What is the food like? Amtrak serves full, cooked-to-order meals, including a vegetarian selection, which are a substantial improvement on microwaved plane meals. Dinners even include a salad and dinner roll. Everything is served with nice disposable plastic plates or shiny silver disposable utensils. Many routes feature seasonal and local dishes. My favorite meal was the signature steak, which I had multiple times. What is like to sleep on the train? Sleeping on the train does take getting used to, but depends on how light a sleeper one is. It was difficult for me to sleep the first night while the train was moving, and you could hear the train horn at night, but I got used to it with time. I slept on the top and bottom bunk of a roomette. The top bunk seems a bit scary at first, but there is a harness on the side so that you feel secure at night and avoid rolling over. Will the train be late? Delays happen and I experienced a number of delays, one which made me miss a connecting train. My number one piece of advice is to allow extra time just in case a train is late. Give yourself around four hours between long-haul connections just in case there are delays, so that you don’t feel rushed to get to your connection and can have a relaxed meal in between trains. Is it safe as a woman traveling solo? Yes, I traveled half of the trip with a friend and traveled solo for the other half of my trip and felt more comfortable and safe than I’ve felt on some buses or flights. Train travel is perfect for solo travelers who are comfortable traveling alone and meeting others over meals. Having my own roomette was very helpful, as I had my own space for my things and a lock for privacy. Note that the roomette doesn’t lock from the outside, only while you’re inside can you lock it at night, for example. Nonetheless, I felt like my things were always safe while leaving them for meals or to look out in the observatory car. There are also a number of staff members around if you ever need something. Are my things safe? Yes, I had no issues or concerns with the safety of my things. To make more room we sometimes put our larger rolling bags on the main cargo shelves. You can also bring a lock for your carry-on to be extra safe. If you prefer to have your things with you at all times, there are ways to stack bags in a roomette, but keep in mind that space is limited. Read on to the end to see if I would recommend this cross-country journey! The Auto Train, between Lorton, VA and Stanford, FL, is the longest passenger train in the world, with 40 cars for both passengers and automobiles. Train travel is the most energy-efficient mode of long distance travel more efficient than flying and driving. The ten busiest trains stations in order are New York, Washington DC, Philadelphia, Chicago, LA, Boston, Sacramento, Baltimore, Albany-Rensselaer and San Diego. Most of these are also the prettiest stations, read more here. Highlights: Enjoy the Northeast views from New York City to Philadelphia to Washington DC. Highlights: Highlights include the Arizona rock formations, Sedona Red Cliffs and the snowy mountain peaks in Colorado. Highlights: Sit back and relish California coastline views. Highlights: Travel through the Rockies, Continental Divide, Glenwood Canyon, Utah Desert and High Sierras. The best part is the volunteers discussing history between Sacramento and Reno, including the Donner Pass and the storied Transcontinental route. Highlights: Enjoy shorelines along Lake Michigan and the Finger Lakes to name a few. For more about these routes, their frequency and what you can see along the way, read our Most Beautiful Amtrak Train Routes. Would I recommend a cross-country train trip? 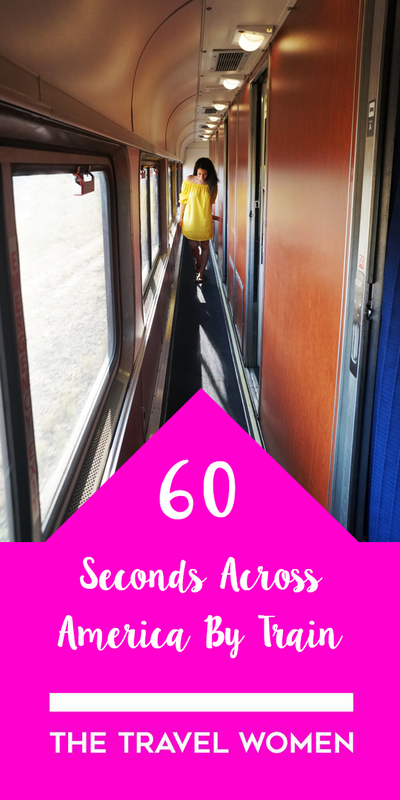 I loved my cross-country train journey! 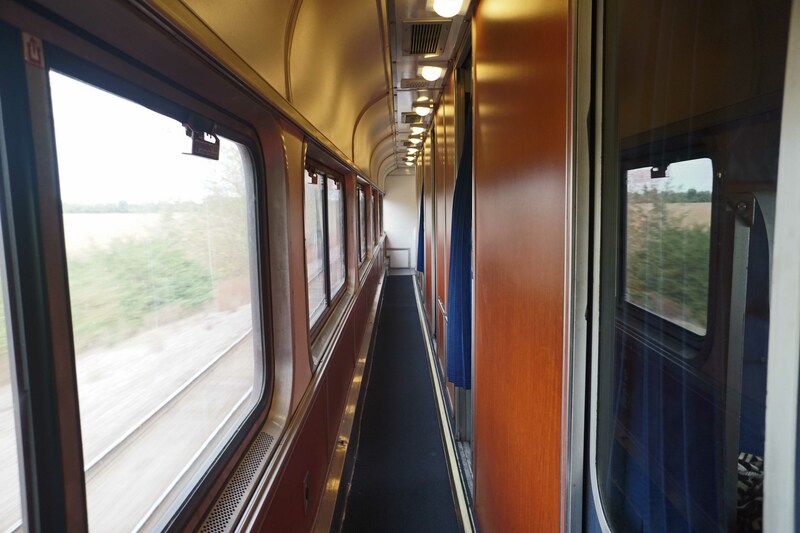 Despite delays and having trouble sleeping at first on the trains, I would definitely take a long-haul train route again, one that I haven’t taken yet, like the Empire Builder. Depending on your budget and timing, I would highly recommend taking one of the most scenic long-haul train routes. Traveling on these long-haul trains or going across the U.S. is a bucket list experience that I think everyone should try! If you have limited money and vacation days, consider doing a shorter leg of a longer trip, like the almost 6-hour Pacific Surfliner train or the National Park Service narrated 5-hour portion of the Zephyr from Sacramento to Reno. These train trips are perfect for people who don’t like flying or driving or who just want to sit back and enjoy the journey. It really is a meditative experience looking out the window and seeing so much of the country that you don’t normally get to see any other way! I would highly recommend it and I believe that taking a long-haul train should be on everyone’s bucket list! Would you take a train across America? Any questions about the journey? Comment below! Oh wow! I’m a 72 year old women who will be going with a male friend cross country. Thank you so much for such valuable information. I’m nervous, but so excited about our trip, but I do have medical issues. Im hoping I won’t cause problems for my friend. But, I’m STILL going anyway!